Many girls like pink color: it is perceives as the symbol of innocence, openness and some lightheadedness. But extraordinary girls choose this color not for stockings or hairpins but for the picture to decorate their bag or other accessories. 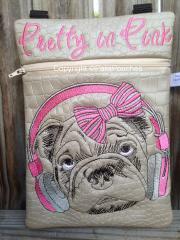 The good example is this Stylish pug-dog machine embroidery design: pink color in combination with sad face of the dog shows your uncommon look to life and readiness for unusual solutions. When you see two items which are equally pretty and attractive and you can’t choose one without any regrets about the other it is not the reason to be sad. It is the reason to choose both! 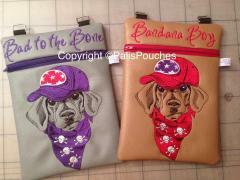 Especially if they are the samples of Stylish dachshund machine embroidery design. 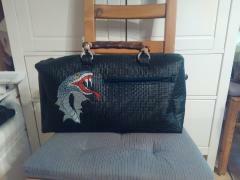 You can use is for decoration of couple of your bags in different colors to be always stylish and dressed with taste. Women love flowers and this is an undeniable truth! Wild flowers, exotic flowers, potted flowers, painted flowers and of course, flowers in embroidery, they are very popular with women. That is why designs with color embroidery, for example, like this one, will always be in demand. Find this designn here: Blue Flower free machine embroidery design. This is good view of nice respectable leather bag which shows all its important advantages. They are spacious form, practical material, expensive appearance and convenient handles. But is main highlight is Nice rose machine embroidery design. It is well places of bag's surface because of apt form and size. If you like this sample you may repeat this success: there are seven (!) different sizes of this picture on our web-site, and you may choose which you prefer. 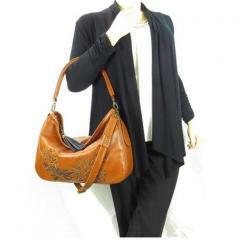 This is rexpectable handbag with convenient handle which is executed from noble thick leather. It could be quite easy in original version. 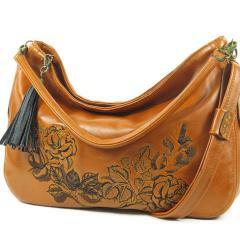 But together with big leather tassel and Nice rose machine embroidery design it looks great. 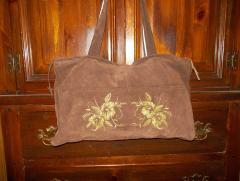 Lady with this bag will definitely attracts many attention as stylish person with deep feel of taste. This simple sample could really transform this thing into memorable accessory. 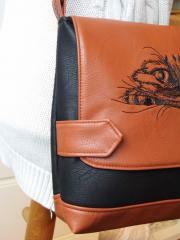 This is side view of nice leather cover prepared by Leather Idea. It let us see what is inside. It is clear that there are some sheets of clean paper. So it is notepad or writing pad for sketches, notes, rhymes or something else. But you also may use this idea for your own work piece such as cover for passport or book. 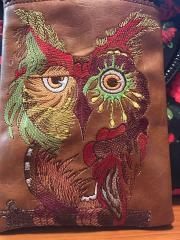 Its front side is decorated by Indian skull machine embroidery design 2. 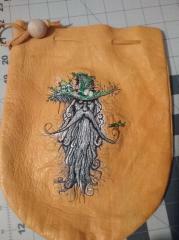 This is cool leather cover made by Leather Idea. It is based on contrast color scheme. This work piece is thick enough to contain a small book. Or you can use it anyway you want: for example for tablet PC, passport or other things. 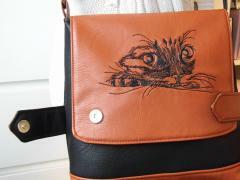 Its front side is decorated with original embroidery sample. 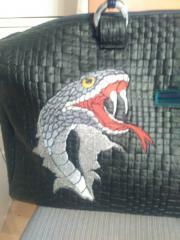 It is Indian skull machine embroidery design 2.